Automobiles really are becoming more automatic. Technology for driverless autos is evolving at Moores Law rates as are advances in battery technology for more cost effective electric powered cars and buses. This wave is coming, let’s be ready to ride it! However, advances in vehicle technology will be largely wasted if we don’t plan now for ways to design our cities for people first and shared collaborative systems that feature more options for the way we move around. We’ll need parking during this transition, but we can double and triple the number of people living and working in our downtown focusing on designing for people first, not cars. Quality context based mixed use neighborhoods, robust transit, bike share like Great Rides, car share, Uber, Lyft, walking are options that save people time and money while better protecting our environment. These options add value and could benefit from autonomous driving technology requiring fewer vehicles. Some of us are already working toward establishing the infrastructure and designing our streets in a way that maximizes the savings with higher value for our citizens and community. Electric Vehicles In ND? Yes We Can! Thanks to all the folks that came out for Fargo’s first Bicnic! We had folks young and not so young pedaling over to celebrate bike month and North Dakota’s and our regions first protected bike lanes. These protected lanes make biking safer and more enjoyable for people young and old. Thanks to sponsors Great Rides, Prairie Roots Food Coop, and Union Lofts for the eats and treats. The consensus is to do it again sometime soon! The Gates family were the first to pedal over. What a beautiful bunch! These young bicyclists pedaled over on their family ride enjoyed the new lanes and ice cream! A new generation of avid bikers. Beautiful family Jen! Thanks for the photo and joining the fun Bob Harris. Completing the Protected bike lanes has already been approved for NP Ave corridor to the Red River. Meanwhile Moorhead is working on improvements for Center Avenue that may include bike lanes and the NP Avenue Bridge already has lots of room for future bike lanes. You can share your preference whether they are on street like the ones already in place on NP between University and 10th St or at sidewalk level. They both could be colored concrete as shown here. Bikes for People gave us a Bike Friendly City rating. Great Rides Bike Share set national use per bike records last year. Let’s keep pedaling forward and Ride ON!! We’re celebrating May Bike Month and North Dakota’s and our regions first protected bike lanes by Union Storage on NP Ave tonight at 6:30. Thanks to Great Rides Fargo for sponsoring the eats, and Union Lofts for the treats!! Stir up your own smoothie with pedal power thanks to Prairie Roots Food Co-op. Much of the progress we’ve made with walking and biking is due to Justin’s good work and other dedicated folks — with Justin Kristan at NP Avenue, Fargo North Dakota. Completing the Protected bike lanes has already approved for NP Ave corridor to the Red River. You can share your preference whether they are on street like the ones already in place on NP between University and 10th St or at sidewalk level. They both could be colored concrete as shown here. Take the survey here. Now that got your attention! 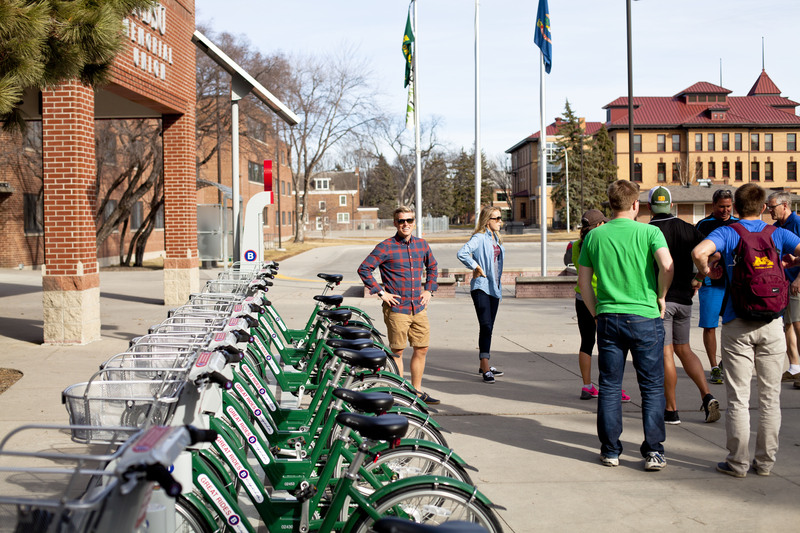 Swing by the Fargo Public Library’s community room Tuesday November 24th at 1:30 p.m.. We’ll learn about and celebrate the many new ways to get around town, user friendly parking info and tools, housing tips and programs, and the positive impact Great Rides Bikeshare has made and how they’re all related. You’ll also get a chance to look and step inside a super cool new sixty foot articulated bus being demonstrated at this event. This bus is being delivered to San Francisco. New Flyer’s are made in St. Cloud and use several components made right here in Fargo! Fargo Matbus Director Julie Bommelman, Moorhead Matbus Director Lori Van Beek, will share about the new Transit Development Planning that is underway Gregg Schidberger about Matbus’s latest national Grand Award and new user friendly tools for folks to enjoy. Gregg and Taaren receiving APTA’s top national award for transit marketing. Congrats team MATBUS! Jeremy Gorden Fargo Traffic Engineer will talk about complete streets and the first protected bike lanes in Fargo and North Dakota. The progress with more on street bike facilities has helped increase number of people biking and fewer bike related accidents. Just in the past year, all these cool new options to get around town. 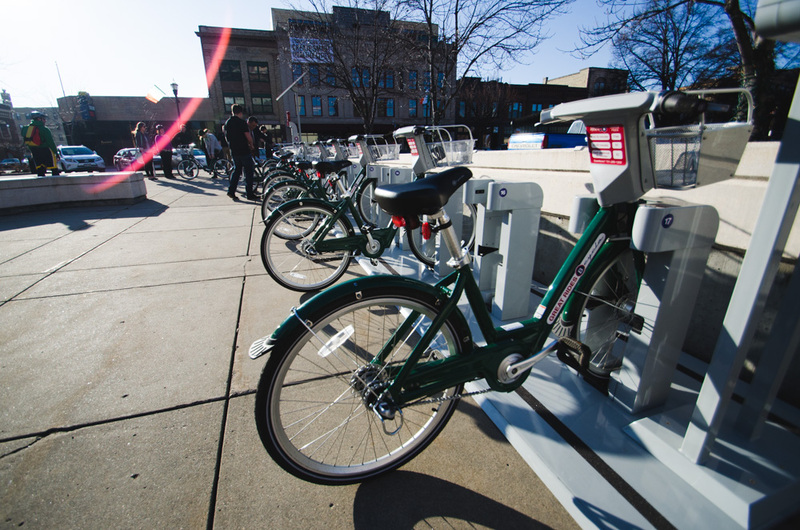 Thanks to good work by many, Fargo’s added several new options for the way we move around our community with expanding transit, the fun, fast, and free Link FM, Great Rides Bikeshare, Uber Fargo, and Fargo’s and North Dakota’s first protected bike lanes all just in the last 9 months. These improvements and continuing to focus on infill, complete streets, and mixed use will make them even more efficient and easy to use. Hope to see you on Tuesday! Where are folks moving to from the Twin Cities? US Census says……….Fargo! No surprise to some of us that have seen these trends evolving as we become a more active, attractive, diverse, and interesting community! We’re not only attracting people and talent from the Twin Cities, but several other counties spread around the US. “Outside the state of Minnesota, the biggest net recipient of Hennepin County residents was not Maricopa County, Arizona (Phoenix), not Harris County, Texas (Houston), not Broward County, Florida. It was Cass County, N.D., home of Fargo. You can see these net gain and loss population statistics with this cool tool from the Census using the Census Flows Mapper. Click on any county in the country and see where everybody’s going. We also have more folks choosing to build their lives in our Fargo area like the 143 people that moved here from Washington County Oregon, and 90 from Weld County Colorado for example. The trend of outmigration has changed 180 degrees over the past decade. At the last Commission meeting, I mentioned some of these very positive changes from our area students to Jim Gartin of the FM EDC. In annual Fargo Public Schools surveys asking students if they plan to stay in the Fargo area, the student responses have changed from about 35% 8 years ago saying they want to build their life here, to now around 65% with more wanting to live, work, learn, and play in our region. Our culture is evolving and we’re becoming a more active and interesting community where people can engage and reach our potential. It’s fun to see people realize our excellent quality of life and the many opportunities to dream and work together as we design our community for happiness. http://electwilliams.com/wp-content/uploads/sites/39/2018/04/web-logo-300x138.png 0 0 Mike Williams http://electwilliams.com/wp-content/uploads/sites/39/2018/04/web-logo-300x138.png Mike Williams2014-02-08 21:01:322014-02-08 21:01:32Where are folks moving to from the Twin Cities? US Census says..........Fargo! Where are the folks moving to from the Twin Cities? Census says………Fargo! In annual Fargo Public Schools survey students asking if they plan to stay in the Fargo area. Those surveys have changed from about 35% 8 years ago saying they want to build their life here, to now around 65% with more wanting to live, work, learn, and play in our region. http://electwilliams.com/wp-content/uploads/sites/39/2018/04/web-logo-300x138.png 0 0 Mike Williams http://electwilliams.com/wp-content/uploads/sites/39/2018/04/web-logo-300x138.png Mike Williams2014-02-08 17:25:372014-02-08 17:25:37Where are the folks moving to from the Twin Cities? Census says.........Fargo!